TIME WAS a doleful sort of fellow in overalls and a trainman's cap could set down, take a chaw, plunk his guitar and commence the mournful tale of the Wabash Cannonball or tell how if he had the wings of an angel or how it was too bad about Barb'ry Ellen. He was a folk singer. Times have changed. Now you got to be hip, man,to dig folk songs and hipper still to sing them. Which brings us to the Limeliters, probably the most "uptown" bunch of folk-singers making the rounds today. A chance meeting in Cosmo Alley in Los Angeles in May, 1959 brought Alex, Lou and Glenn together for the first time. Organized as the Limeliters, they broke in the act at Aspen, Colorado in June and July. In August, just three months after they met, they started their six month engagement at the hungry i that can only be depicted as sensational - to use an apt, albeit much over-worked "show biz" term. Considering the cerebral - not to say musical - attributes of the group, their hitsoric [sic] rise to the top of the folk-singing heap was surprisingly fleet. In September, 1960, they played San Francisco and Los Angeles with the Johnny Mathis Show, winning the sort of reviews that de- lighted everyone. This was followed by a national tour with Mort Sahl, which was actually the turning point of their career and established the Limeliters as the hippest, most original vocal group in the country. Since the Sahl tour they have played over 250 concerts of their own in every major city and on most of the major college campuses in the United States. Taking time off from this busy concert schedule the Limeliters have recorded six albums (One on Elektra and five on RCA Victor) and a number of single releases. Their albums have consistently been among the country's best sellers averaging over 200,000 copies each. Meanwhile they have made several highly successful TV and radio commercials for L&M cigarettes, Folger's Coffee and the Ford Motor Company which are by now familiar to everyone. Finally, but too numerous to mention (fortunately) have been their appearances on such TV shows as Ed Sullivan, Dinah Shore, Jack Paar, The Lively Ones, Steve Allen, and the one hour show on PM East, de- voted entirely to the Limeliters. Several national magazine stories have helped to spread word of the Limeliters and add to their fame. 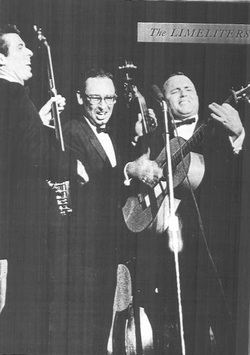 Time remarked that "If the Kingston Trio are the under- graduates of big-tiine U. S. folk-singing, the Limeliters are the faculty . . ." and Newsweek called them ". . . the most versatile and musically challenging of the mnny groups now performing." A recent issue of the Saturday Evening Post devoted a three page picture story to "Our Boys." Recently, with the enthusiastic help of the Berkeley Public School system, the Limeliters opened new vistas in the folksinging concert field by performing special children's material accompanied by a chorus of over seventy school children who were meticulously rehearsed during Christmas vacation. These successful ventures were recorded by RCA Victor and issued in an album which the Limeliters call "the finest we have ever been associated with." Also recently recorded is an album of religious and gospel songs. Entitled "Makin' A Joyful Noise" it will be released soon, and expose still another facet of the Limeliters' varied talents. Wherever they go the Limeliters seem to release unbridled enthusiasm in audiences of all ages and backgrounds. "Unashamed eggheads" are attracted to the refreshingly far-out humor; teenagers enjoy the up-to-the-minute newness of the way they "sing their time;" children re invariably captivated by everything the Limeliters do and anyone with a musical orientation revels in their advanced harmonies and arrangements that, in the words of one observer "make three voices sound like six." Finally, the Limeliters are obviously involved in what they are doing and they enjoy their work to the full. Their solid musicianship and high sense of comedy are combined with a pain-staking devotion to seeking out the right tunes and the best arrangements - all presented in their own unhackneyed fashion. As one critic wrote, "The Limeliters, is one of of the rare and unique acts that has something to say to everybody."